Backed by a dedicated team of strategic, technical and digital marketing experts, our analysts help unlock the value of your website to create tangible returns and sustainable growth. We are not talking about something abstract or infeasible. 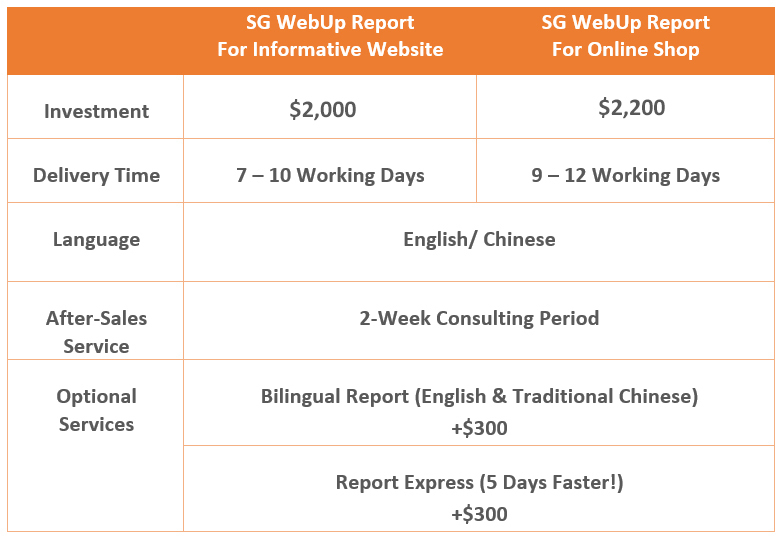 With our SG WebUp Report, comprehensive, practical and easy-to-understand analysis and advisory are offered. With our 17 quality indicators, you will have a clear picture on how to improve your website to enhance its performance in the following aspects. Even without any technical background or programming knowledge, you can still learn the performance of your website thoroughly and hand the report to your developer for next-step optimization. So as to facilitate your understanding, we also provide 2-week consulting period in which you can ask us ANY questions via email regarding the report. We promise to respond you within 2 working days. What are you waiting for? Fill out the form here to optimize your website now! Why improving website performance is important? With 93% of business purchase decisions start with a Search Engine search (Source: Search Engine Journal, 2012) and 79% online shoppers who experience a dissatisfying visit are less likely to buy from that website (Source: Akamai®, 2009), website is more than the first impression that you show to your potential clients. It actually represents your brand and professionalism, which directly affects your sales and revenue. I would like to know how my website performs before I decide whether it needs improvement. Sure, you can find out your website performance through our free test! Is the SG WebUp Report practical? Of course! Our 17 quality indicators act as a step-by-step guide to enhance your website performance which is also the core value of our WebUp Report. You can simply pass the Report to your technical staff or vendor and they will be able to follow the steps and carry out the improvement work. How do you evaluate the performance of my website? After studying your website, we will evaluate it from various angles and aspects based on our own 17 Quality Indicators which are established by our professionalism in website development and suggestions made by a lot of well-known leading industry experts, including Google, Bing, Kissmetrics, Leadsquared, etc. What if I don't understand the Report? We offer a 2-week consulting period in which you can ask ANY questions about the Report via email correspondence. The advantage of using email is that you can provide us with the screen captures of the part you are unsure about, and we can accurately and efficiently clear all of your doubts. We promise to reply to you within 2 working days. Ready to boost your website performance? Fill out the form here to optimize your website now!